My morning drive on the 101 from Newbury Park to Ventura starts with an awesome view from the top of the Conejo Grade and finishes with a glimpse of surfers at the point through the Ventura Pier’s support timbers. Bright green fields of strawberries, tomatoes, peppers and other row crops dot the empty spaces between the shopping centers, and residential and commercial developments along the 101. Often you can see a string of old and battered mini-vans, SUV’s and station wagons parked besides the fields with a small army of pickers dressed in multi-colors contrasted by the green expanses of the crops’ foliage. How do these estimated 20,000 farm workers afford to reside in one of the most expensive places to live? The average farm worker earns $17,000 per year. To afford a three bedroom apartment here you need to earn $85,000 per year. It is not uncommon to find three families or three generations of a family, with maybe twelve members, sharing the expenses of one apartment or living in garages and sheds. 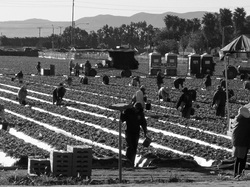 Saticoy, where Highways 126 and 118 meet just east of the City of Ventura, is one County location where some farm workers reside along with other low income, elderly and disabled persons. The elegant Saticoy Country Club contrasts with the low income housing provided by the Cabrillo Economic Development Corp.
Catholic Charities has been assisting these families for the past ten years through our San Jose El Trajabador (St. Joseph the Worker) Food Pantry. Twice a month Hal Fulkerson and his band of twenty or so volunteers show up to box donated or Food Share supplied food staples for the Cabrillo Village and Saticoy community residents. Canned and packaged chicken, tuna, peanut butter, pasta, rice, beans, vegetables, fruits, and cereal are combined to last a frugal family two weeks. The next day these boxes of staples for small, medium and large families are distributed to over 300 families each month at the Jose Flores Community Center. Teri Hernandez of the Ventura First Assembly of God partners at the Community Center to bring fresh produce, meats and dairy products to these families. Additional food donated through Trader Joe’s, Von’s or other organized food drives, such as, postal workers, Boys Scouts, or churches may be available. Each family receiving the food goes through an intake process to verify income and other criteria established using USDA guidelines. “The families are most often large, underemployed or unemployed,” says Mary Ann Decaen, one of the dedicated volunteers. “These families often express their appreciation and gratitude for the food they receive. Several in my experience that land a better paying job come back and ask to be taken off the client list while expressing their gratefulness,” comments Mary Ann. You can see how the bounty of Ventura’s rich soil can lead us to the Lord. It is written “He who is gracious to a poor man lends to the LORD, and He will repay him for his good deed.” (Prov. 19:17). Thanks to our volunteers and to you for your support of these programs. Any organization or individual wishing to volunteer can call Hal at 805-218-7421.